Why sit indoors when you can take the entire living room outside? Usually people remember the furniture, rugs, tables and wall decor – but they forget about lighting. A regular outdoor overhead light, exterior siding lights or solar lanterns aren’t going to cut it. We need ambiance! 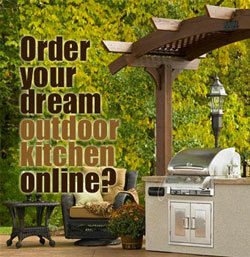 Think about your outdoor space like you would the inside of your house. Yes, overhead lighting is good, but what about task lighting and accent lighting? Lighting is a simple way to make your outdoor space more usable at night – but also more attractive. The key to good task lighting in outdoor rooms is to incorporate table lamps and floor lamps that look like those found in a typical living room. The Plow & Hearth Outdoor Slate Table Lamp is designed specifically for outdoor use, with its weather-resistant shade and weighted base. However, it looks deceivingly like an indoor one. This is exactly what we are looking for! Besides being stylish, this table lamp is substantial in size, so it will give off a good amount of light and get notices in an outdoor space. Whether you use it on a front porch to welcome guests or on a back patio as a living room reading light, this lamp makes a staement. It measures approximately 10″ x 16″ x 28″ high. I really like this lamp because it is so versatile – lighting both a table and floor with one lamp. Plus, you can dim the lighting for a more natural or relaxing feel in the space. You know how it feels when you walk into the lobby of a fancy Hawaiian resort? This lamp reminds me of that. Put it together with a wicker furniture set, a tropical-looking area rug and some palm plants, and you can feel like you’re on vacation all the time! 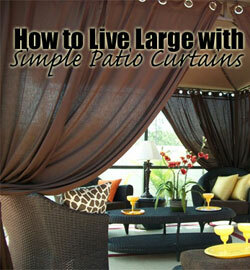 A nice benefit to using floor and table lamps in your outdoor rooms is that you can move them around if necessary. Typically, you probably wouldn’t want to move around your lighting, but if you were throwing a party or inviting a large amount of guest over, it’s nice to know that you can re-arrange your lamps right along with the furniture to meet your needs. 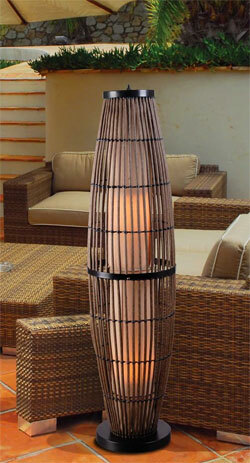 This traditional floor lamp is designed for the outdoors, made of durable PVC with a heavy weighted base. The lamp shade is made with durable Sunbrella fabric, so you know it will last, even if it gets lots of sun during the day. 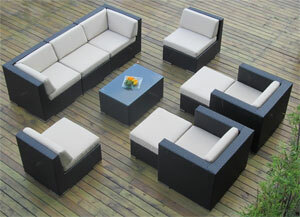 It’s 55″ tall but is narrow enough to easily fit between 2 pieces of furniture or in the corner of your outdoor room. The nice thing about these taller lamps is that they can provide good light to read by, but they can cover more area too. 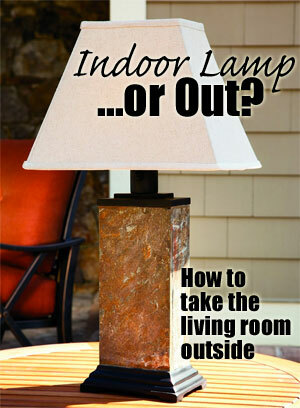 If you don’t want to install overhead lighting, a couple of these taller lamps could work as a viable alternative. 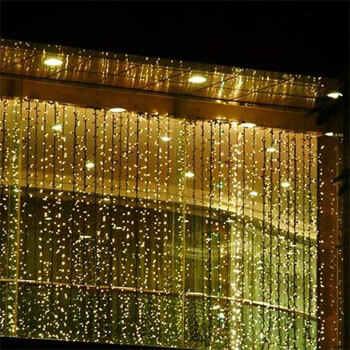 String lights can be an easy way to create ambiance in your outdoor space if you are looking for subtle lighting at night. This set of 600 lights actually creates a “wall” of twinkling lights that you can set to either flashing, fading or steady (8 options total). They create a nice, relaxing backdrop and can even be used in combination with outdoor curtains if you want additional privacy.